The Daily Spurgeon: Visit the Reformed Quotes Fellowship! We seldom interrupt our regularly scheduled program, but I wanted to invite you to visit a brand new website called Reformed Quotes Fellowship. RQF was the brainchild of Web luminaries Matthew Blair from The Octavius Winslow Archive and Erik Kowalker from J.C. Ryle Quotes, with just a little prod here and there from yours truly. What's the aim of RQF? “The Reformed Quotes Fellowship exists to bring together those of us throughout the internet who have created and administer websites, blogs, and other media outlets that are dedicated to routinely posting quotes from writers, preachers, teachers, and scholastics of the reformed faith. 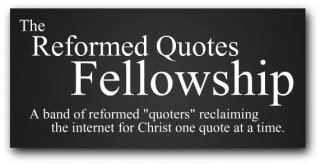 If you have a blog or website which consistently posts a handful of Christ-centered quotes every month, or if you know of one, we invite you to join us at the Reformed Quotes Fellowship as we aim to redeem the internet for the glory of God and the benefit of His church…one Christ-centered quote at at time. Special thanks to Matt Blair for making a nice graphic that doesn't look like it will be obsolete in six months.